As parents of adult children will attest, parenting is a lifetime commitment. However, across the lifespan, the parenting tasks necessary for young people’s optimum development change. As children enter formal schooling, the responsibility for a child’s development becomes more of a shared responsibility between their home and their school. This is reflected in Bronfenbrenner’s Ecological Model of Child Development which proposes that child development does not happen in isolation, but rather is the product of multiple influences and settings interacting. The transition to school can be both an exciting and a nervous time for parents and children, as it is a period of great change, challenges and many ‘firsts’. One of the key qualities children need to do well during this time, is a sense of self-efficacy for facing the new tasks and challenges that will inevitably confront them. There are also important parenting tasks that will assist children to make the most of the very important school years. 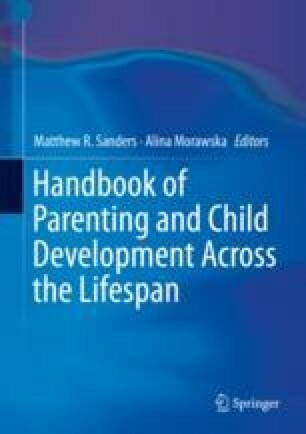 Specifically, this chapter will address these parenting tasks under five categories: (1) physical health and well-being; (2) social development; (3) emotional development; (4) language and cognitive development; and (5) communication. The parenting tasks that are unique to special populations will also be highlighted using examples of parenting gifted and talented children, and children with disabilities. A positive partnership between a child’s home and their school (home–school partnership) is essential for children’s academic, learning, and well-being outcomes. What this home–school partnership looks like and the key role that parents play in building this partnership will be explored in detail. Some issues faced by lesbian, gay, bisexual, transgender, queer, intersex, and asexual (LGBTQIA) students and LGBTQIA parents in schools are also explored in greater depth to better understand the unique experiences of these groups. The chapter concludes by discussing implications for policy and practice. The Parenting and Family Support Centre is partly funded by royalties stemming from published resources of the Triple P—Positive Parenting Program, which is developed and owned by the University of Queensland (UQ). Royalties are also distributed to the Faculty of Health and Behavioural Sciences at UQ and contributory authors of published Triple P resources. Triple P International (TPI) Pty Ltd. is a private company licensed by UniQuest Pty Ltd. on behalf of UQ, to publish and disseminate Triple P worldwide. The authors of this chapter have no share or ownership of TPI. Dr. Hodges is an employee at UQ. Ms. Kirby is a graduate student at UQ.